I no longer look at the decluttering process as a chore in fact I really enjoy it. I look for the positive in in every little effort I make. I no longer focus on the enormity of the task and just revel in the good feelings I get every time a piece of clutter leaves my house. There is such a feeling of accomplishment and freedom associated with ridding myself of objects that bring me stress rather than the joy I thought they represented when I brought them into my life. I have almost forgotten what the feeling is like that is evoked by retail therapy. I think I was pretty much over shopping before this decluttering process even started or maybe that was the catalyst. Whenever I am forced to go to my local shopping centre usually that is just for groceries these days, I actually feel sorry for all the people around me clamoring for one item or another that they feel is lacking in their lives. how you are are feeling about the clutter (how it now feels like it owns you, how you feel smothered by it, the quilt when you look at all that stuff you are sorry ever came into your life in the first place). Focus on the good feelings to keep you motivated and when you falter remember the bad feeling and how you don’t want to go back there and keep on forging ahead. 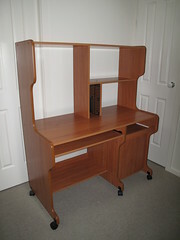 I thought I would give you a break from snow gear and throw in this computer desk the was far too bulky for the space we had it in.